A Destinies Choice Pack has a Twist of Fate card (enhances beginning of game), a Compass of Fate and three armour sets, each for a specific class. The Fate-Touched Weapons Pack contains various "rare" Fate-Touched weapons: a longbow, a hammer, a staff, faeblades, daggers, scepters, chakrams, a longsword and a greatsword. The Ultimate Treasure Hunter Pack has a Dowsing Rod that will seek out reagents to help you brew potions with. Which shops offer which of these pre-order packs is still being worked out. Kingdoms of Amalur is the action-packed but sprawling RPG being made by 38 Studios and EA. Much has been made of the names associated with the project: Ken Rolston (designer, Oblivion, Morrowind), R. A. Salvatore (best-selling author) and Todd McFarlane (creator of comic Spawn). 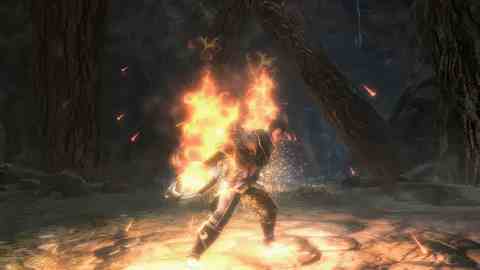 The results so far show potential, wrote Eurogamer in its Kingdoms of Amalur: Reckoning preview. Certainly, EA has done itself a favour by putting daylight between the launch of Reckoning and genre mega-weight Elder Scrolls 5: Skyrim.